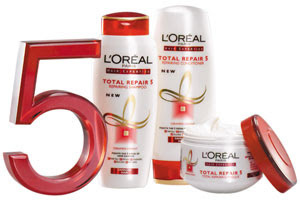 L'Oreal 'Total Repair 5' promises to repair the 5 signs of hair damage. Damaged hair can lack the natural cement which keeps the hair strong & resilient. To ensure cohesion and strength, the L'Oreal Laboratories have created ceramide-cement technology to replicate the hair's natural cement, targeting the 5 problems. Repairs : the hair fibre, the hair structure is re-inforced and hair regains strength like new. Transforms : the hair surface to a regular and smooth condition. I am loving this range so far. The smell is perfume-like, a little bit like Dior Pure Poison perfume, in my opinion. I like. My hair that hardly shines has suddenly lit up. Not patent leather shine but I'm hopeful it will get there (fingers crossed). I can't say much about whether or not it stops hairfall because I still catch a few loose strands while washing my hair. But that usually happens to me with other products too. I love the attractive packaging and the price too! L'Oreal consumer haircare products used to cost so much more a few years ago but now I am very happy with the reasonable price tags. Her hair looks great though. i loooove all of loreal's shampoos! Looking forward to try this. ad is slightly over the top..need to try the product though.I love their professionel range. @Rati...thanks Rati n pls thank yr friend for me ;). I really like this range. i love tryig loreal's shampoo and conditioners! they always work for me, but i stop using them after abit cos ma har gets used to it. but i'll defo try this out! lovely post hun! I love loreal shampoos especially the re-nutrition range :) Havta check this out! I've got a variant of this line, can't remember the exact name though. The ad, well, it was an ad. Meant to be over the top sometimes. :D But, phooeee, Aishwarya's hair is to die for (OK, maybe they exaggerated the shine a great deal!). going off topic, i LOVE the colour on her lips! delicious! & yea, the ad is totally over the top.. lol..
Hi Cynthia, I have awarded you an award. ohh .. this new range is sure affordable and excellent .. gotta get a new shampoo !! loove the new look. sent you a mail two days back at the address mentioned in the about me section. simply words of encouragement. keep it up! oh sorry i meant the contact section. @Amira~ I approve all comments :) Everyone is entitled to her/his own opinion. Too bad it didn't work for u. They make my hair soft n shiny but I did notice some hairfall. @Christina~ I do want to try the Lotus Kerasys. Almost bought so many times...now I will give it a shot. Thanks. haa i m so confused,.... i was wanting to change my shampoo and try loreal's total repair 5.. although my hairs not dry, neither do i have hairfall or spiltends but has lost shine.. so was hoping to change.. mixed reviews on the page cant afford to loose hair.. wht do i do now? i bought dis shampoo today, till now i was using pantene n it was good too, but i have lots of splitends...so i thought of switching to loreal... bt aftr reading dis comments m lil worried... my fiance likes long hairs so ny other suggestions other than loreal? i'v been using loreal shampoo and conditioner and em jus waiting for the bottles to finish off ...coz my hair has becum even more drier and rough... it definitely is a STRICT 'no no' from me!